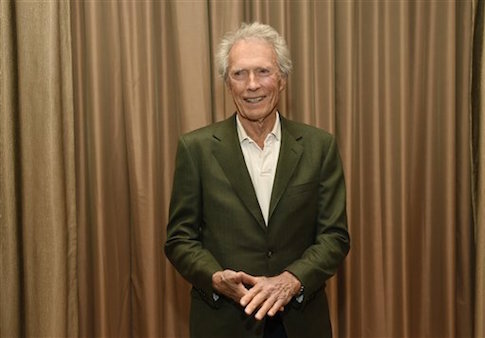 Clint Eastwood was asked on Wednesday whether liberal director Michael Moore's allegation that Eastwood threatened to kill him 10 years ago, and Eastwood's response led to rousing applause from the crowd at CinemaCon in Las Vegas. "Everyone keeps saying I threatened to kill Michael Moore. That's not true," said Eastwood, who then added that "it isn't a bad idea." The joke was received by the crowd with rousing applause and laughter, according to USA Today. Moore claims Eastwood told him that he would "kill" him if he ever came to his house with a camera and tried to interview him. Moore was an outspoken critic of Eastwood's American Sniper, labeling it "a mess of a film that rewrites history" and calling the film's subject Chris Kyle a "coward." Eastwood has come out on top of the feud with Moore in every way possible. American Sniper grossed more than $500 million worldwide and was the most seen movie in 2014. Eastwood added in his speech that he took issue with Moore's decision to go to the house of the National Rifle Association's Charlton Heston, who was suffering from Alzheimer's disease at the time. Eastwood said that if Moore were to go onto his property it would be a perfect opportunity to use his trademark line: "Get off my lawn." This entry was posted in Culture and tagged American Sniper, Chris Kyle, Michael Moore, NRA. Bookmark the permalink.